Children spend 15,000 hours sitting down during their school years & approximately 13% of children aged 10-16 experience significant recurrence of back pain with the main cause being poor posture (FIRA). In support of Back Care Awareness we take a look at the growing trend of back pain in children and how we can help you reduce this in schools. Lyndee Oscar founder of Kids Backs 4 The Future CIC, and a registered osteopath of 25 years says she has seen a dramatic increase of youngsters developing back problems mainly related to poor posture. Developing the correct posture in children from a young age is vital for their development. How does this impact their education? All of the above can effect a child’s ability to concentrate. Clear evidence has been found that well-designed primary schools boost children’s academic performance in reading, writing and maths. The study found a 16% variation in learning progress over a year when comparing classrooms with different physical characteristics. Physical characteristics found to be important included comfortable, interesting and ergonomic furniture, (Prof Peter Barret et al, Salford University, Feb 2015). How can you make a difference in schools? Choosing the right school chairs & desks for the age of your pupils. School chairs are grouped into size marks from 1 – 6. The sizes are grouped based on the average height of a child within each age range. Their feet flat on the floor. If their feet can’t comfortably reach the floor, a box or footrest should be put just in front of the chair. Ankles, knees and hips all at 90 degrees. Height appropriate and child centric desks to support learning such as the shape are also important in promoting engagement in pupils, (Prof Peter Barret et al, Salford University, Feb 2015). Different colours are said to have various psychological effects. Wall and furniture colour play an important role in schools. Lighter wall colours with additional colour elements from furniture & equipment was found to play an important role in increasing stimulation. Using colourful furniture can have significant effects on pupil’s learning activity and their well-being (Jalil et al 2012). “A school in which movement is supported and encouraged has a positive effect on the learning ability and attentiveness of the children,” (Dr Dieter Breitheckerxi). School furniture should allow for dynamic sitting & flexibility. The lack of flexibility with some chairs means children lean back on chairs and and frequently change their position on the chair, (FIRA). Furniture should be adaptable and easy to re-arrange into various configurations to move from group/individual work to suit different learning environments. 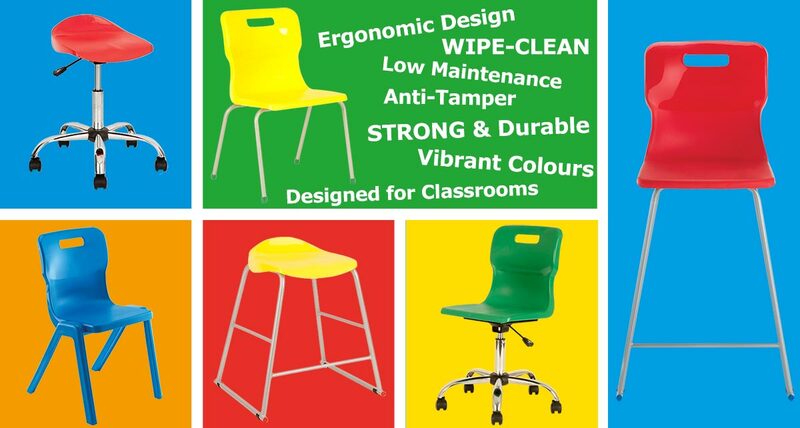 Titan furniture supply a wide range of school chairs all offering ergonomics, colour & movement vital to support the development of children in schools. They are a leading supplier of school chairs in the UK and were the first UK manufacturer to meet new British ergonomic standards set out by the Technical Committee for Europe Cen/TC207.